Q. How do I copy and paste a citation from EBSCO to Noodlebib? 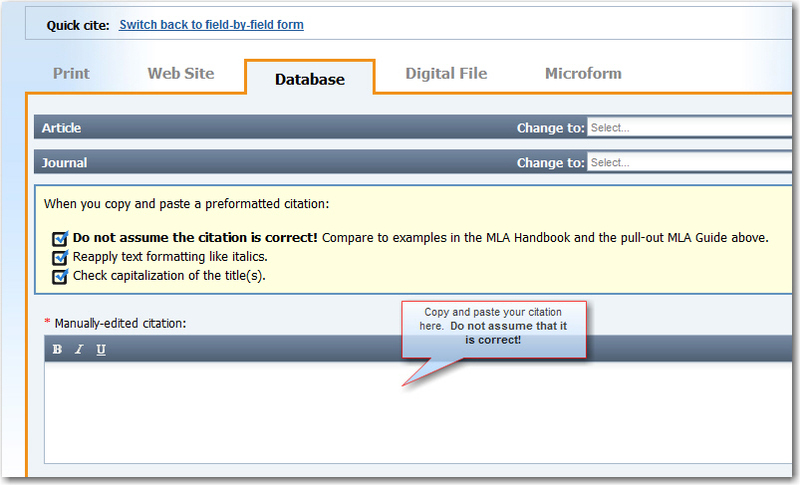 If you have been asked to complete a work cited page the library has a tool called Noodlebib that can help. This tool will create a perfectly punctuated bibliography in an APA, MLA or Chicago punctuation style. Keep a list of all the sources you have used. A source can be a magazine or newspaper article, book, website, or DVD, etc. Doing research in the digital age is sometimes easier and more convenient, however if you don't keep good records while researching completing your works cited page will be a challenge. In the past it would be easy to tell the difference between a newspaper article, a magazine or a book. The challenge in the digital age is to tell one print out from another. Find out what kind of citation style your professor requires. A style is a set of rules established which explains how sources used in your paper should be presented and punctuated. There are several different styles including MLA and APA and your professor will probably have a preference. Just ask them or check your syllabus for specific information. Remember many of our databases have several types of sources contained within them. It is not good enough to know that the print out came from EBSCO, Gale or another subscription database. This will bring you to a brief description of your source. All the information you need for your citation is located there. 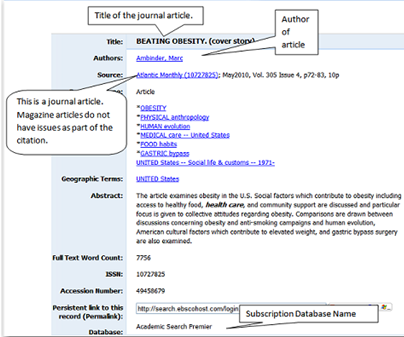 In terms of taking a citation directly from the database, on the left hand side of the page, there is a cite link. You will need to determine the source before you copy and paste to noodlebib.